Arsene Wenger will leave Arsenal without his fairytale farewell. Europa League heartbreak: Arsene Wenger. 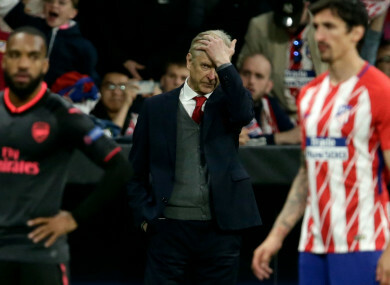 ARSENE WENGER WILL leave Arsenal as a “very sad” man at the end of the season after he was unable to guide the club into the Europa League final in his last campaign at the helm. Wenger announced his decision to depart in April, after being in the job for nearly 22 years and presiding over three Premier League title wins and seven FA Cup triumphs. His imminent exit was seen as an extra incentive for the players to secure a Europa League crown to send the 68-year-old off on a high. But, after drawing 1-1 at home with 10-man Atletico Madrid, Arsenal lost 1-0 in Spain on Thursday as familiar foe Diego Costa scored the decisive goal. And Wenger acknowledged it is a sad ending for him, with his last game at Arsenal set to be against Huddersfield Town rather than in a European final. “It’s very sad, very, very, very sad,” said Wenger. “I’m very sad to leave the club with that exit. “It takes some time to recover from that, after I will see what I do with myself in the future. I have no plans at the moment. “I am like the team; very sad and very disappointed, even very frustrated, as well, because when you go out of a competition and you had the performances in the 180 minutes that we had, it is very difficult to take. “We missed something in the final third. You look at the number of chances we created in the two games, the least you can say is we can be very frustrated. “Congratulations to Atletico and good luck in the final. The winner of tonight’s game is the clear favourite to win the competition. Atletico will meet Marseille in Lyon on May 16. Email “'I'm very sad to leave the club with that exit. Very disappointed, very frustrated'”. Feedback on “'I'm very sad to leave the club with that exit. Very disappointed, very frustrated'”.